Quoting Libya’s Jana national news agency RIA Novosti reported that the coalition planes “had eliminated almost all the tanks of Gaddafi’s forces in Ajdabiya, leaving them no chance for defense” on Mar. 26, Day 8 of Odyssey Dawn. For sure, the allied planes are giving the rebels the support they need to push westward towards Tripoli. With most of the Gaddafi’s forces hit by allied strikes, the rebels retook both Ajdabiya, a strategic oil town located about 60 miles to the south of the revolutionaries main stronghold of Benghazi, and Ras Lanuf oil complex. A rebel representative affirmed today that anti-governative plan to start exporting oil from various fields in the territory under their control in less than a week, and that they have already signed a contract with a Qatari oil company that agreed to export and market the oil (100.000 to 130.000 barrels up to 300.000 barrels a day in the future) for them. 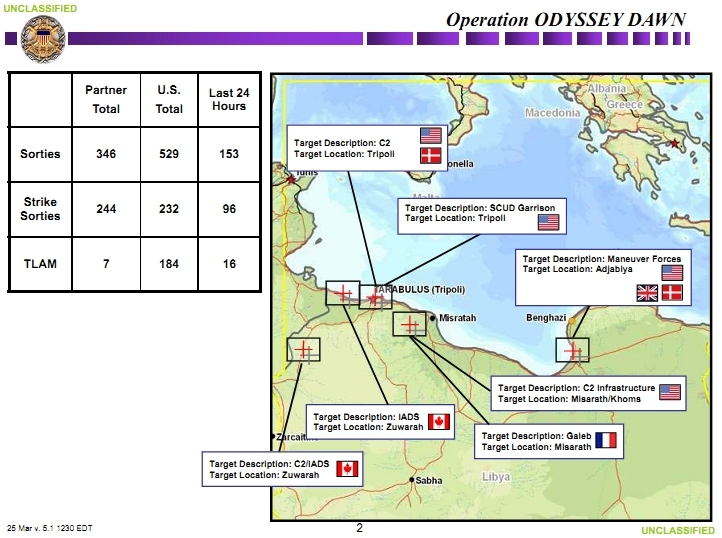 At least, Odyssey Dawn unlocked the Libyan oil export. 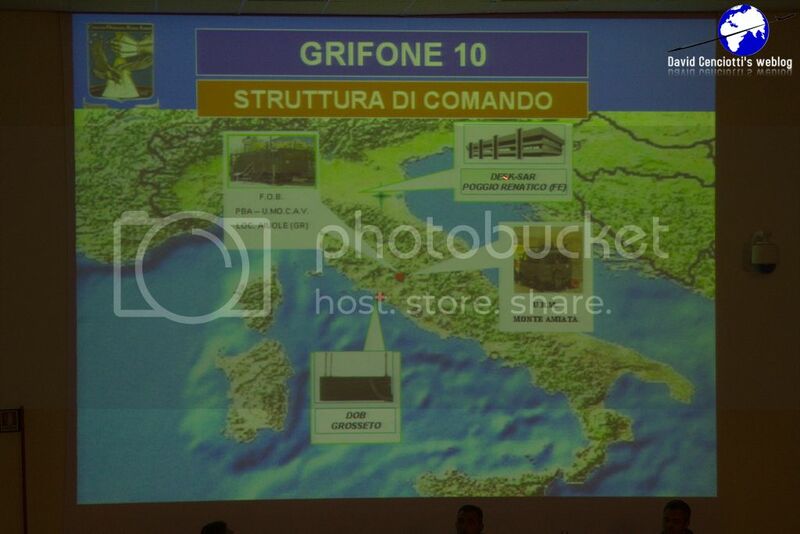 Below images were taken from the Pentagon press update on Mar.25. They give an idea of the most important sites. During the morning, the coalition planes attacked Sabha airbase and auto transport center in southwest Libya while, according to the French Defence Ministry, among the afternoon waves, French Air Force planes attacked loyalist’s armor and army’s weapons depot, in the regions of Misratah and Zintan. In the evening the allied strikes hit Tripoli and, for the first time, Sirte, Gaddafi’s hometown, strategically located more or less halfway between the rebel-controlled east and the loyalist-held west. Among the others, strikes targeted the road to the Tripoli International Airport, located about 10km outside the city. 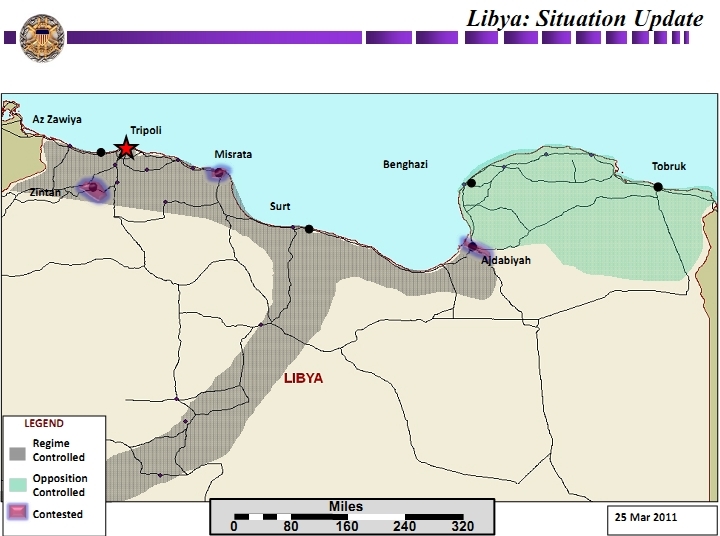 The timeline of attacks of Day 9 gives a clear idea of the situation of the air defences and anti-aircraft establishments in the various areas of Libya: while the Benghazi and, more in general, eastern Libya is more or less secured of any surface-to-air threat and can be attacked during daylight (with such platforms like the A-10 or the AC-130U that usually fly at low level), Tripoli is still presumed to be defended (at least on paper) with some sort of mobile SAM (SA-8?) or MANPADs, because it is attacked exclusively after nightfall (and, probably at medium to high altitude), when (and “where”) the risk of being hit by AAA (Anti-Aircraft Artillery) or residual SAM missiles is sensibly lower. As I write this report, the news of a flight of B-1Bs crossing the Pond awaited by some KC-135s launched from Moron airbase, Spain, has already spread. Most probably the “Bones”, in a typical Global Power mission across the Ocean from Ellsworth AFB, South Dakota, are bound to strike Sirte, in preparation for rebels’ advance on Day 10. 1) NATO will assume command of all military operations in Libya from coalition forces under UN Security Council resolution. After taking over the maritime arms embargo and No-Fly Zone enforcement tasks, the North Atlantic Council approved in the evening the plan to expand the previously agreeded tasks taking full command of all military operations in the country. 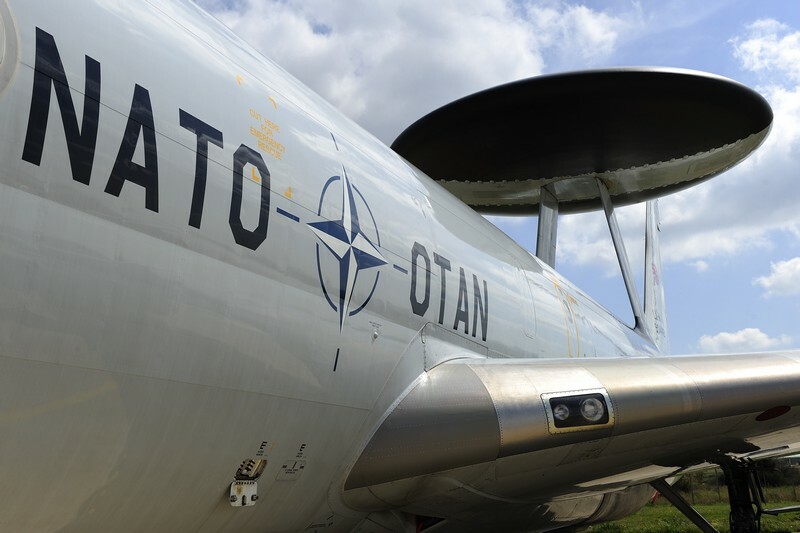 Hence, NATO will protect civilians from attack, meaning that it will plan, coordinate and conduct also offensive missions against targets on the ground. The transfer of authority from the US-led force could take some days. 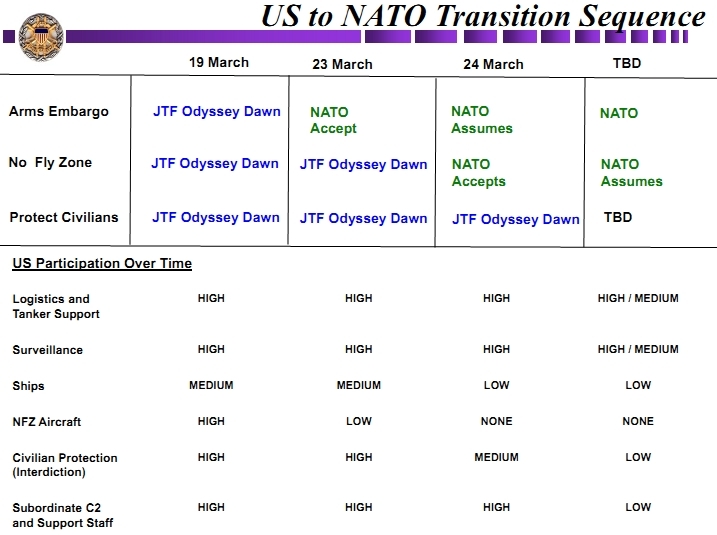 The Nato operation had already been named Unified Protector. Here are the names of the other national missions: US and Italy: Odyssey Dawn; France: Opération Harmattan; Uk: Operation Ellamy; Canada: Operation Mobile. 2) The RDAF F-16s carried out two air-to-ground missions in the past 24 hours, bombing mobile artillery units south of Tripoli. Altogether the Danish contingent with 6 F-16s based at Sigonella airbase has conducted 28 missions: 27 air-to-ground and 1 air-to-air mission. Some interesting details were provided by the RDAF about the targets hit: initially, the Danish planes hit fixed targets as ammunition bunkers and command centers, then the F-16s participated in strike missions against government forces tanks and rocket launchers, which threatened the rebels. Previously the Danish aircraft had hit about 15 tanks and rocket launchers as well as three mobile long-range SCUD missile ramps. 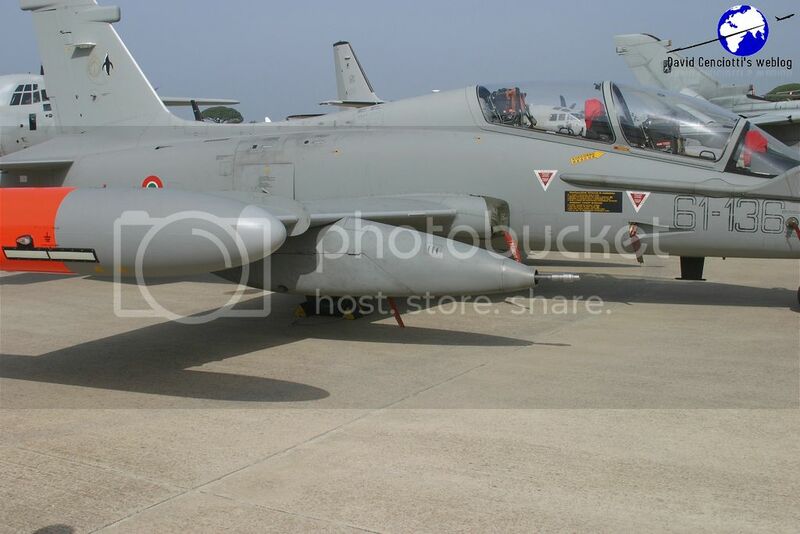 Three FAF Mirages are currently deployed to Souda Bay to fly together with the Qatar Emiri Air Force Mirage 2000-5 based there. 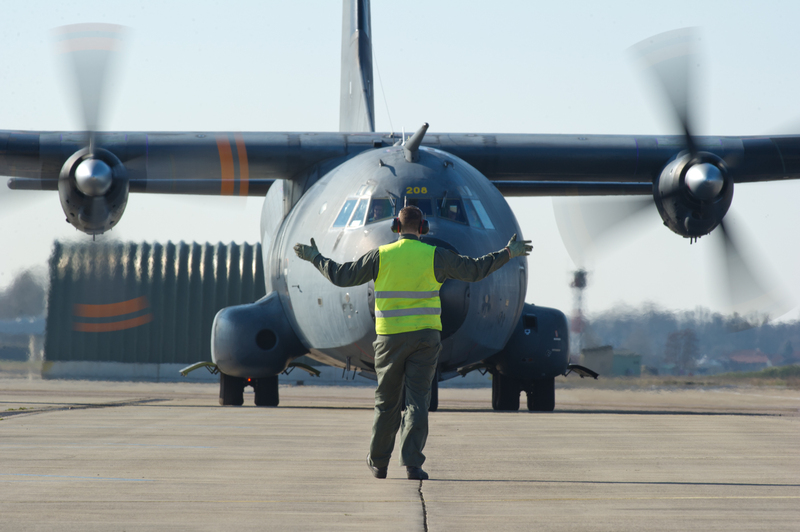 The Spanish maritime patrol aircraft CN-235 deployed to Decimomannu to perform maritime patrol missions required to enforce the UN arms embargo on Libya, successfully performed its first mission, lasting 6 hours (take off at 14.00LT landing at 20.00LT). 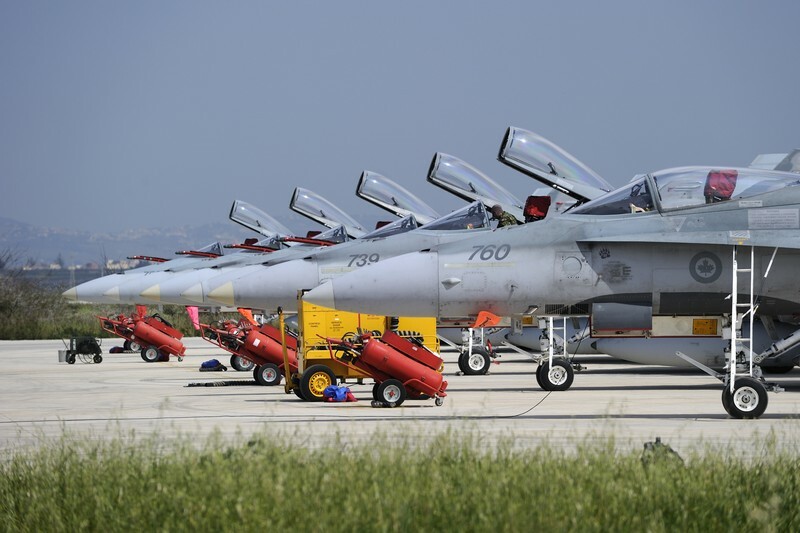 Dealing with the other Spanish aircraft deployed to Decimomannu, during the first week of Odyssey Dawn, the 4 SpAF F-18s flew 15 missions (59.4 flight hours) and the Boeing 707 refueling aircraft carried out a total of 5 missions (27.8 flight hours). Also based at Decimomannu, in Sardinia, is the RNlAF detachment with 6 F-16MLUs, which sent today two “Vipers” into the Libyan airspace for their first Odyssey Dawn sortie. 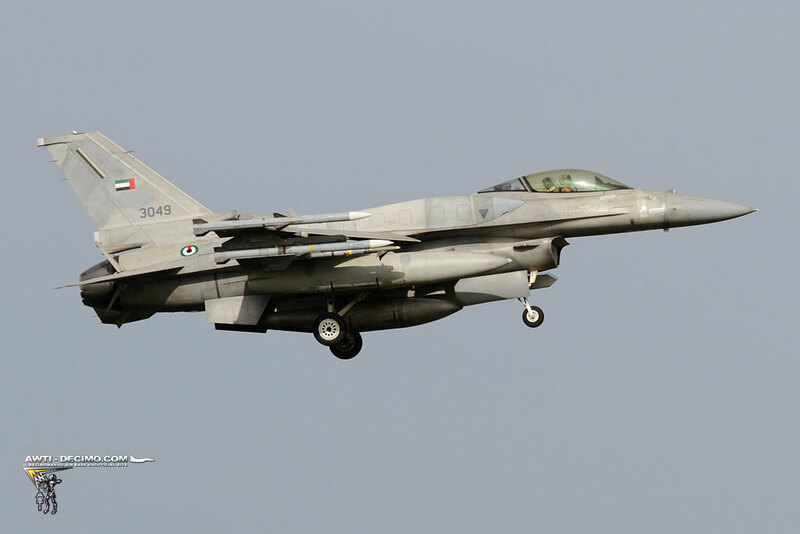 Another first on Day 9 was that of the Belgian F-16s based in Araxos which flew the first strike hitting ground targets in Libya (location unknown). Italian and Canadian air forces flew many sorties out of Trapani. The airport will be closed to civil flight at least until Mar. 31. All scheduled services (Ryanair comprised) were moved to Palermo Punta Raisi airport. 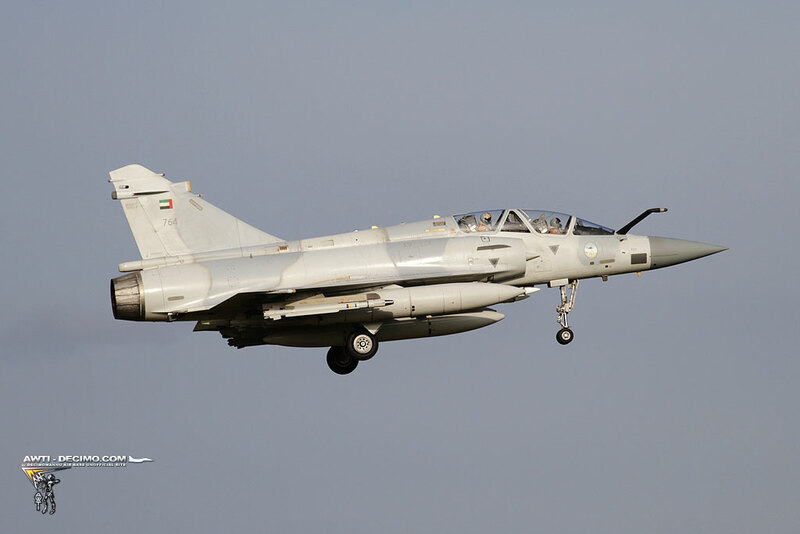 3) Beginning at 15.30 GMT 6 F-16E/Fs Block 60 and 6 Mirage 2000-9DADs of the UAE Air Force deployed to Decimomannu officially joining the coalition forces enforcing the No-Fly Zone over Libya as the following pictures, courtesy of Massimo Pieranunzi of AWTI-Decimo.com show. 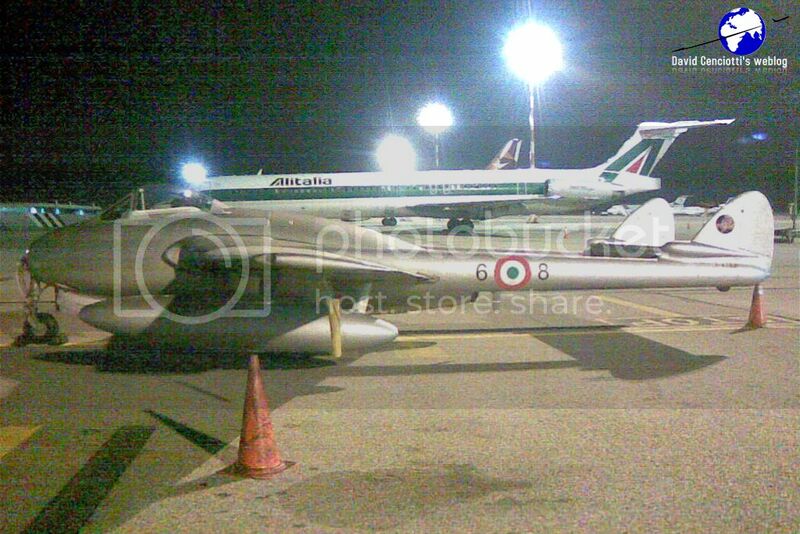 The aircraft were supported by an A-330 that arrived in Cagliari Elmas airport earlier on Day 9. Both aircraft types should be start their operating in support of Odyssey Dawn from the next couple of days. It will be the combat debut for both types of aircraft. 4) Another PSYOPS message was intercepted, this time by an Italian radio ham, who recorded it and published it on Youtube with basic information about the HF frequency used to broadcast it and date. The message was probably broadcasted by the USAF EC-130J (00-1934/STEEL74) of the 193 SOS, operating out of Souda Bay, Crete, and it is particularly interesting since it invites in both American and Arabic languages sailors and naval officers of a Libyan ship to leave the vessel and return to their families. The Gaddafi regime forces are violating a United Nations resolution ordering the end of hostilities in your country. Do not take part in further hostilities. Refuse any order to harm your fellow countrymen or Libyan facilities. Return to your home and family. Your family needs you. Return home safely. Lay down you arms and refuse orders from your current illegitimate government. Any hostilities against coalition forces will be met with deadly force. Do not harm your fellow countryman. Stop fighting. Abandon your equipment and weapon and return home safely. Libyan ship or vessel remain anchored. Do not leave port. The Gaddafi regime forces are violating a United Nations resolution that is ordering the end of hostilities in your country. If you attempt to leave port you will be attacked and destroyed immediately. For your own safety, do not leave port. Leave your position immediately and return to port. The Gaddafi regime forces are violating a United Nations resolution ordering the end of hostilities in your country. If you leave now and return to port, no harm will come to you. For your own safety, return to port now. Libyan sailors, leave your ship immediately, leave your equipment and return to your family or your home. The Gaddafi regime forces are violating a United Nations resolution that is ordering the end of hostilities in your country. For your safety, leave your ship immediately. Do not attempt to return to your ship. Libyan naval officers, leave your ship immediately. For your own safety return to your family or your home. The Gaddafi regime forces are violating a United Nations resolution ordering the end of hostilities in your country. Leave your equipment, take only your personal belonging and return to your family or your home. Libyan naval officers, the Gaddafi regime forces are violating a United Nation resolution ordering the end of hostilities in your country, your sailors have been ordered to leave your ship immediately, you should do so as well. Leave your equipment, take only your personal belonging and return to your family or your home. 5) The CC-150 (A310) Polaris (serialled 15005) of the Canadian Armed Forces deployed to Trapani, once again (read Day 4 report for more details), during the night mission on Day 9 broadcasted full ADS-B information for everyone to see on flightradar24. This means that the trasponder was not tuned to prevent everybody from watching all the flight path of the Canadian tanker as I had guessed in Day 5 debrief (Pt.4) (hence, the A310 not broadcasting full ADS-B was another one).